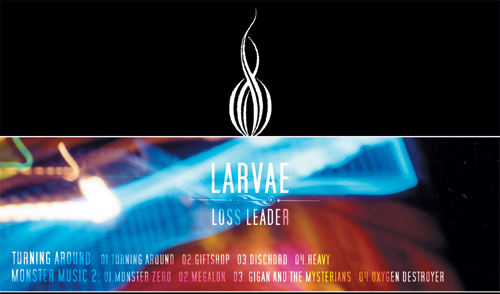 Another of the threads running through all of the Larvae albums is the use of photos taken with the Lomo LCA camera. I got my LCA for Christmas back in 2000 and I proptly took roll after roll of blurry, color-saturated, light-painted pictures with it. During my 2002 trip to Japan, it was the only camera I brought so all of my snapshots from that vacation are odd. I've never been much of a photographer, but I've always liked what I could produce with the Lomo. On Fashion Victim, lomo prints hide subtly deep within the green of the album cover. On the inside of the digipak there's also a beautifully squiggly lomo picture of some lights in the Ginza. Swirly Lights on the inner sleeve! 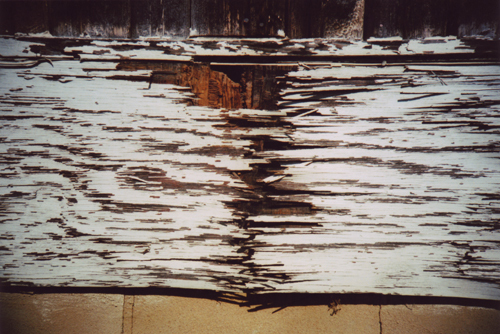 For the cover of Dead Weight, I took pictures of barns out in rural Georgia, focusing on the wood texture and the cracks that would eventually give some depth to the brown sleeve for that album. The shack on the cover was at the end of a driveway somewhere about an hour East of Atlanta. 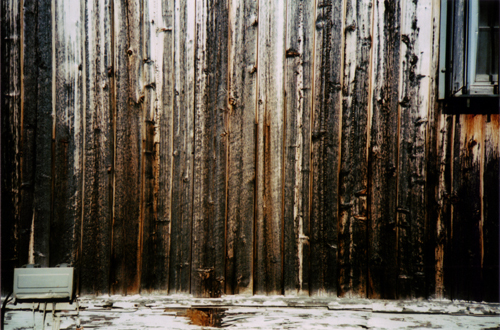 That picture was taken with a digital point-and-shoot, but these wood textures from the LCA are all over the record. With Loss Leader, the Lomo took center stage, providing the cover image--an extended exposure of some whirling dervishes performing at Agnes Scott College. There's also another light painting picture on the inner sleeve that was taken during a performance at Eyedrum, and more squiggly lights on the back! Whirling! Loss Leader Liner Notes Blurry Lights and Words. Now, more than a decade after I got my LCA, I'm still finding uses for it in the Larvae art department. Though the cover of Exit Strategey is built from photos taken by my new DSLR camera, there's a lovely shot on the inside of the jacket that I took with my trusty old LCA. It's nothing particually special, but the pinhole effect and the gray sky gives the photo just the right tone to fit with the album. A tree in Austin, March 2011. Beyond the LCA, some of the videos for Exit Strategy will incorporate footage shot with the LomoKino, Lomo's movie-maker that shoots tiny movies on regular 35mm film. We have stitched together LCA photos for a video before, but this new camera opens up a whole new world of possibilities. Look out.